Breanna Stewart has her eye on the ball as she prepares to grab one of her 14 rebounds. 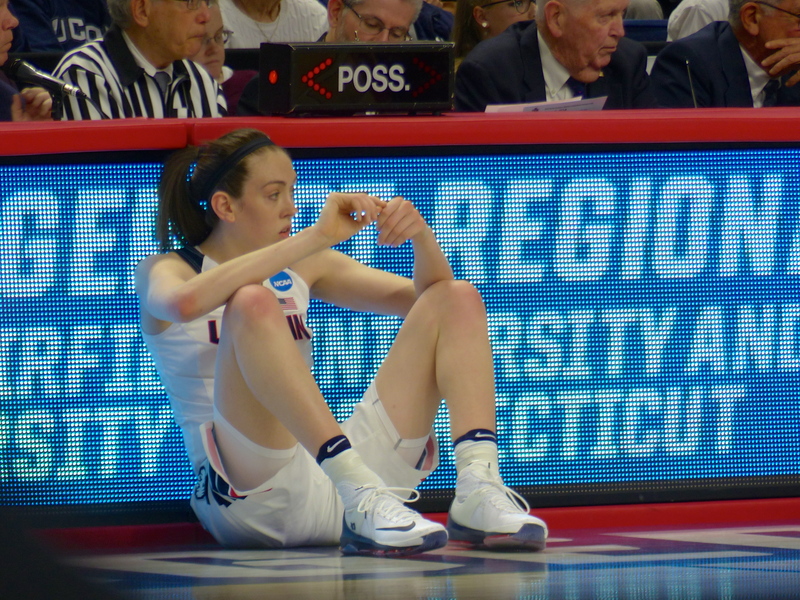 When sophomore Gabby Williams front-rimmed a foul shot in the third quarter of the UConn-Mississppi State regional semifinal Saturday, the crowd gasped. It was an indication of just how perfect the Huskies had been that an errant free throw would seem so out of place. 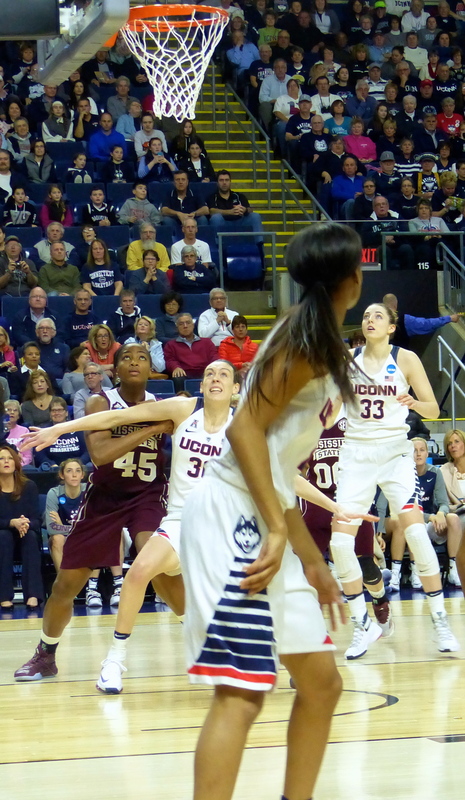 On Saturday, UConn could do no wrong in its regional semifinal game in Bridgeport. Every time Mississippi State tried to take it to the hoop, Breanna Stewart had been there to block or alter the shot. Time after time, Moriah Jefferson and her Huskies teammates had tipped Mississippi dribble drives and converted them into fast-break points. At the half, the Huskies were up by an amazing, 61-12. 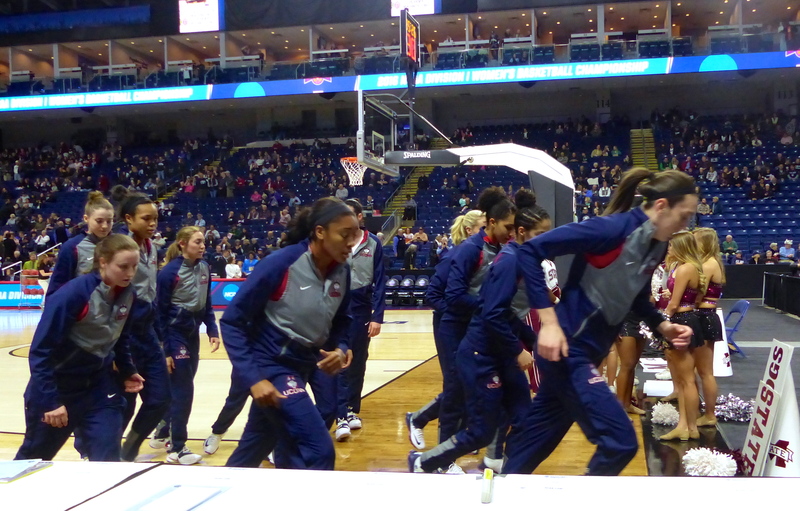 At the end of three (after we’d seen the last of the UConn starters), the score was 84-20. The 2016 Huskies have won 72 in a row and the margin of victory has averaged more than 30 points. Only one team has held them to less than 70 points — South Carolina, which lost to Syracuse Friday night. Only one team has scored more than 70 points against them — Notre Dame, which lost to Stanford Friday. In answer to a question about the Huskies’ place in history, Schaefer said their record — if they four-peat in Indianapolis next weekend — would easily make them the best team in history because of the increased parity in the women’s game. “When John Wooden’s teams were winning all those games, there wasn’t the parity there is today,” he said. Schaefer’s remarks run counter to the grudging respect most women’s basketball fans pay the Huskies. (Not to mention the misogynistic naysayers who declare that UConn is ruining the game). Many women’s basketball fans bemoan the team’s incredible dominance and the lopsided nature of the games they play. Even the biggest UConn fans at the game, the season-ticket holders all decked out in their Husky navy blue, admit that they wish the games were more competitive. “I feel sorry for the other teams,” said Sara Foster, who was there with her family from nearby Trumbull, CT. But to be in Bridgeport and to watch how a Huskies’ win unfolds is to come away with a newfound appreciation for the artistry this team displays and the incredible confidence they have in themselves and each other. Time after time after time, mistakes against UConn turned into fast-break baskets at the other end. And those fast breaks were textbook things of beauty — usually ending with the wing being rewarded with the ball after two passes down the court found her open and in position for the easy score. Mississippi State is a young team and it didn’t take long for them to get that deer in the headlights look when they brought the ball up the court. Occasionally this season, the Huskies have come out of the gate a little more slowly, feeling their way, which sometimes allowed the other team to gain a little momentum and actually hang around — scorewise — until halftime. But Breanna Stewart admitted that the team was determined to start strong and keep the pedal on the floor the whole way Saturday. They’d watched South Carolina and Notre Dame, the number one seeds on the other side of the bracket, be upset by lower seeds the night before. “We weren’t going to let that happen to us,” Stewart said. Stewart checks back in for a brief second half appearance Saturday. Stewart made sure of that. She started the scoring with a long three and ended up with 22 points on 80 percent shooting. She controlled the defensive boards with 14 rebounds and five blocked shots and a steal in just 25 minutes of play. Schaefer had seen plenty of film of Stewart. But watching her on film or on TV gives viewers but a glimpse of her many talents. Seeing her up close, and watching her away from the ball, reminded me of the first time I saw Bobby Orr play in person at the old Boston Garden. Being quick, being smart, and being strong leads to being in the right place time after time. Geno Auriemma muses about life after Stewart. Stewart’s hardly doing it alone. While she will be far and away the top pick in the WNBA draft this spring, teammates Moriah Jefferson and Morgan Tuck (if Tuck, a red-shirted junior, decides to declare for the draft) will also be selected early in the first round of the draft. Still, Stewart is making a strong case for being the best Husky ever. 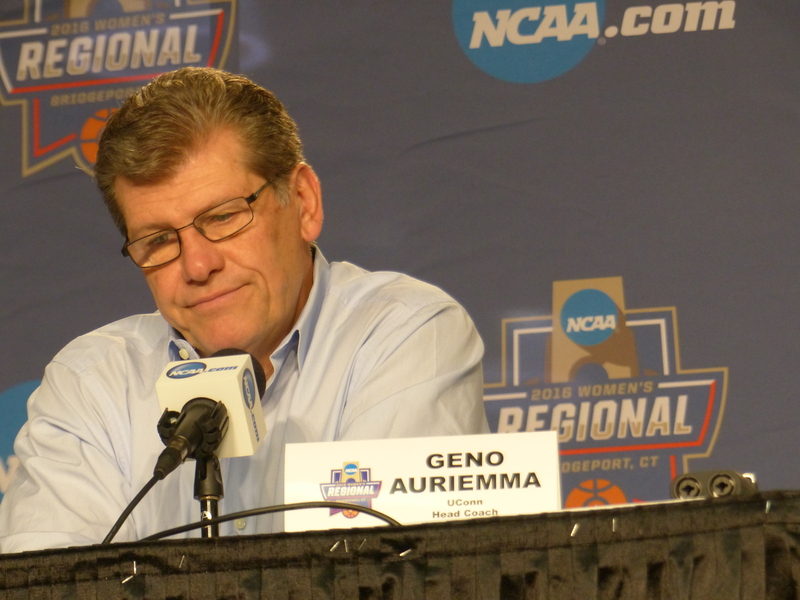 Geno Auriemma gets a little choked up when he talks about his 6-4 forward. She has three games left in her college career “knock on wood,” Geno says, and he is making sure to appreciate every moment. Jefferson and Stewart rode the bench most of the second half, and the Huskies still beat Mississippi State by 60. For a team on a 72-game win streak, the end has to come sometime. But with Breanna Stewart leading the way, no one’s betting on anyone stopping the UConn juggernaut this season.